To replace your job income you must determine how to generate different streams of income. the easiest way to do this is through passive dividend income. You can start with one monthly dividend check and increase it to as many checks as you want to receive each month. I have known people who collect more than 100 monthly dividend checks! Here are some rules to guide your monthly income dividends. The first rule is to focus on dividend payers rather than growth stocks, value stock or any other stock pushed by the guru of the month. History tells us that owning dividend paying stocks and reinvesting dividends beats all other investment options. Over the last 10 years, dividends may be the only return seen by many investors as the S&P 500 was relatively flat during this period. Dividends have contributed 42% of total return by the markets since 1920. As for reinvesting your dividends, you get more compounding return from monthly dividend payers than quarterly dividend stocks or semi-annual dividends like many bonds pay. When you invest in monthly dividend stocks, you will be spoiled in a few months as you experience the growth of passive income. The second rule is that it is always tempting to take the cash but you should reinvest all or a portion of your dividends. This will grow your monthly income as you purchase more shares in dividend payers. For example, a $20,000 portfolio with a yield of only 7% will grow total dividends from $1,400 to nearly $2,800 with reinvested dividends and 6% dividend growth over five years. This is the power of compounding returns and the success of this strategy. Rule 3: If you have a choice between a low yield of say 3% or a higher yield of 9% always take the higher yield if the securities are both fundamentally strong. After all, your goal is to create a monthly dividend portfolio of dividend stocks so a higher yield produces more income. One exception is to be cautious when investing in ultra-high yield stocks of say 20% or more. These stocks usually have a bad reason for the higher dividend yield so it is best to avoid these payers. You keys to finding good stocks is a payout ratio below 80%, strong cash positions, fundamentally strong and a good history of dividend payments. The easiest place to locate monthly dividend payers is through closed-end funds (ETFs). Monthly ETF payers can be found in many categories such as taxable, non-taxable, domestic stocks, foreign stocks, specific stock sectors, bonds, REITs, and many more. In fact, Rule 4 says you should consider investing in different sectors to diversify your monthly income dividend streams. You can create a monthly income strategy by putting together the 4 rules outlined in this article. Over time, your monthly income from dividends will replace your monthly income earned through wages. Then you are financially free to decide how to spend your day and time. Real wealth in measured not in dollars but having the free time to pursue the life you want to live. 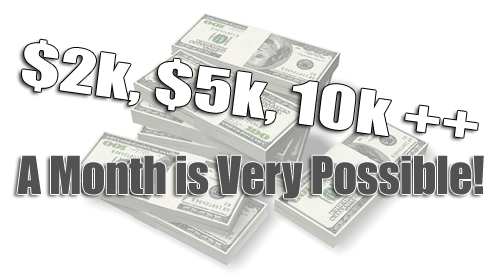 Get PAID to rent Stocks for Monthly Income!